Tensions between Russia and the West have hit new heights following the loss of 300 lives in the disaster involving the Malaysian Airlines plane MH17. Russia Beyond the Headlines: What assistance is Russia prepared to offer the international investigation into the Boeing crash? 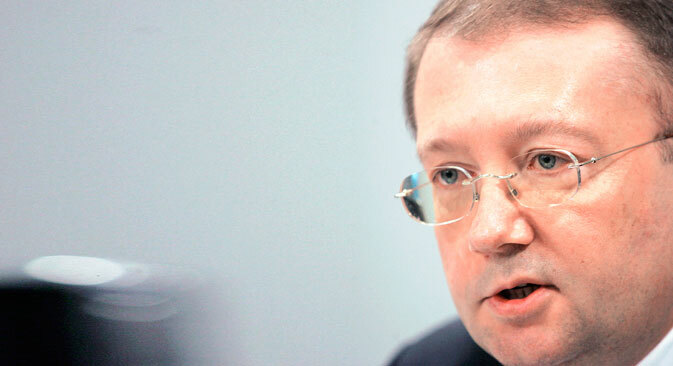 Alexander Yakovenko: Russia was the first to call for an independent international investigation. To this end, the UN Security Council passed Resolution 2166 with our active participation. At the Defence Ministry briefing (on June 21), Russia presented air traffic monitoring data on just what went on in the air over Ukraine at the time of the Malaysian Boeing catastrophe. In fact, military intelligence was provided, and we proposed that the American side take analogous steps that have not, unfortunately, taken place. RBTH: To what extent has the Security Council's resolution on a ceasefire in the area around the crash site been implemented on the ground? Who will enforce compliance with the resolution? A.V. : The fulfilment of the resolution depends entirely on the will of the two sides engaged in the civil conflict. The de-facto local authorities in Eastern Ukraine have repeatedly called for a ceasefire. However, only on the fourth day after the catastrophe did Kiev announce a ceasefire, and it went unobserved by its forces. Artillery fire - including from multiple rocket launch systems - on populated areas inside the crash zone has continued. It is natural to expect the OSCE observers already in Ukraine to take some responsibility for managing the ceasefire. Their mandate could be expanded accordingly. The Ukrainian government, on the other hand, with its pretensions to legitimacy, bears full responsibility for events in the country, as this tragedy with the airliner could only have occurred in conditions of civil war. RBTH: How has the Boeing disaster impacted the political situation between Russia and the European Union? Are new sanctions a threat to Russia? A.V. : Unfortunately, the MH17 disaster has exacerbated the rhetoric towards Russia on the part of several EU countries. Under pressure from the United States, an attempt is being made to introduce new sanctions against Russia, in the absence of any kind of evidence - as shown by American intelligence's officially closed briefing (on June 23) - of Russia's or the local involvement in this tragedy. RBTH: Is Europe now becoming an independent player on the world stage, or will it remain in the political orbit of the US? What factors are at work here? A.V. : We would very much like to see Europe – the EU - become an independent player in international affairs. Russia is ready to be part of such a Europe. However, the entire story of the Ukraine crisis – launched as it was by a supposed “technical project” of the Brussels bureaucracy's EU-Ukraine Association agreement - looks like an open conspiracy against Europe's independence. It is difficult to pinpoint just how the Americans exert control, but possibly, when difficulties arise, they will pull any strings necessary. It makes sense, given the unprecedented nature of the current situation, with all the deferred legacies of the end of the Cold War simultaneously coming home to roost. In my view, we are seeing the impact of the Western elite's general unpreparedness - whether political-psychological or intellectual unpreparedness - for such developments. RBTH: How will the West react to “resurgent Russia” in the long-term? A.V. : The very term “resurgent Russia” misinforms. Russia is going through a comprehensive transformation, becoming a normal country. The most painful stage of this process is already behind us. Therefore, there is no basis at all for confrontation between the West and Russia, much less over the long term. Moreover, the very concept of the “historical West” is receding into the past, together with the experience of the Cold War. In terms of prognosis, I would point to Robert Legvold's article in the latest issue of Foreign Affairs, “Managing the New Cold War.” The main thing is, if such a scenario is possible, such folly will be very short-lived. RBTH: How much time will pass before Russia and the West can overcome the inertia of the Cold War in their relations? Do we need to wait for a new generation of political leaders? A.V. : I partially answered this question already. I think that we do not need to await the next generation of political elites. None of our countries can allow themselves to wait so long. Most likely, we will have to wait out the end of electoral cycles in a few countries, including the US, with its mid-term elections in November this year. We mustn't forget that everything in Euro-Atlantic politics occurs in the context of increasingly multi-polar world politics, economy and finance. And so, living in one's own closed-off world simply won't work anymore, nor will living as we did before. Globalisation will not allow it. RBTH: Do Western countries have enough resources to deal with all these new regional crises? I'm not referring to Africa, but to Europe and the Caucasus. A.V. : It is obvious that under current conditions, no one country or group of countries is in a position to cope with the whole complex of new challenges and threats, regional crises included. We are convinced that only a truly collective effort by all countries can hope to resolve the Euro-Atlantic's problems. This will not be possible without restoring the trust that has been undermined over the past 20 years. The benchmark for this effort should be the founding of a region-wide system of collective security, with indivisible, equal security for all and without dividing lines. RBTH: Why does Russia sympathise with the rebels in the Donetsk and Lugansk People's Republics? A.V. : We sympathise with the DPR and LPR not only because they are Russian-speakers, with whom we spent many years in a unified country, and with whom we have diverse ties in terms of history, ancestry, economy, etc. Simply put, these people are acting in defence of rights that are guaranteed in Europe -including those of minorities - rights which the current Ukrainian authorities have denied them. They want only one thing: to resolve all these problems through political negotiations with Kiev. Had Kiev gone to the negotiating table and formally rejected the use of force against the population of these regions, there would be no civil war in the southeast of Ukraine.